I’m very excited to finally have this model finished. I have been working on and off on this project for quite some time now, trying out various ideas and trying to get the right parts for the conversion. There were times when I doubted my own ability to pull this off or struggled to get him to look the way I imagined him and more than once I set him aside to work on other projects. 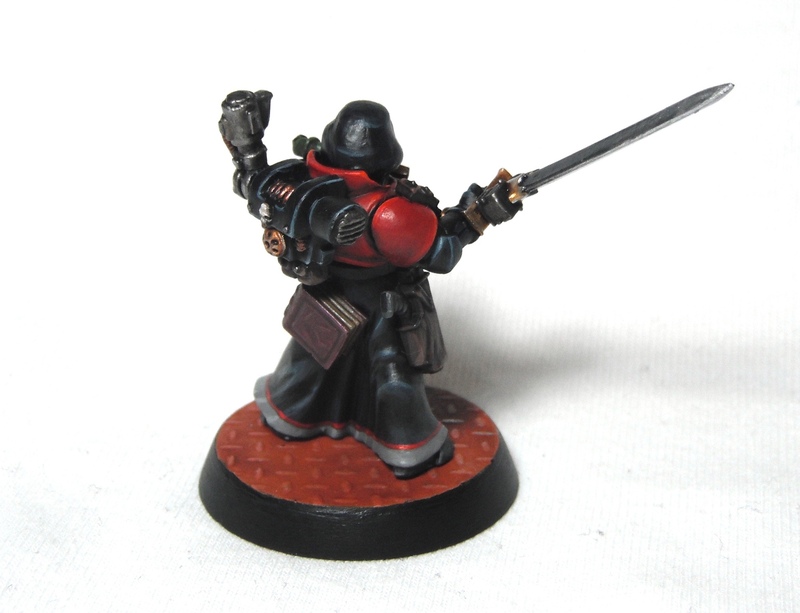 I have always been inspired by the so-called Inq28 movement (aka ‘Inquisimunda’)* which has been around on forums for a while now and the ‘Blanchitsu’ series of articles in White Dwarf and Warhammer: Visions and wanted to make my own Inquisitorial warband in a similar spirit. 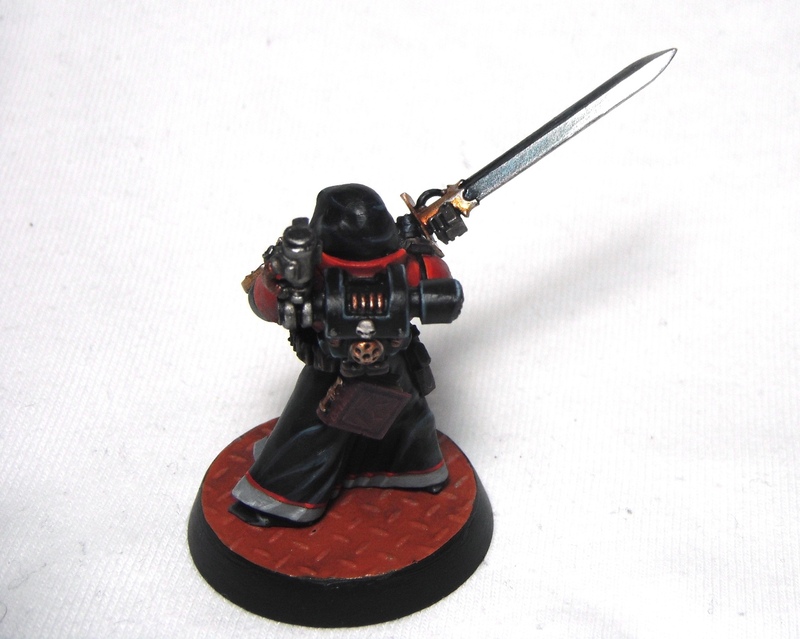 Those of you who have been in the hobby a while may also recognise the other obvious inspiration for this piece: the 54mm Inquisitor Covenant model from 2001. This isn’t an attempt to replicate the original model exactly but is rather done in a similar spirit. Although I have been in the hobby for 20 years, converting and sculpting are two things that I have not really done much of over the years and so this project was an opportunity to try out new things and really push myself in those areas. 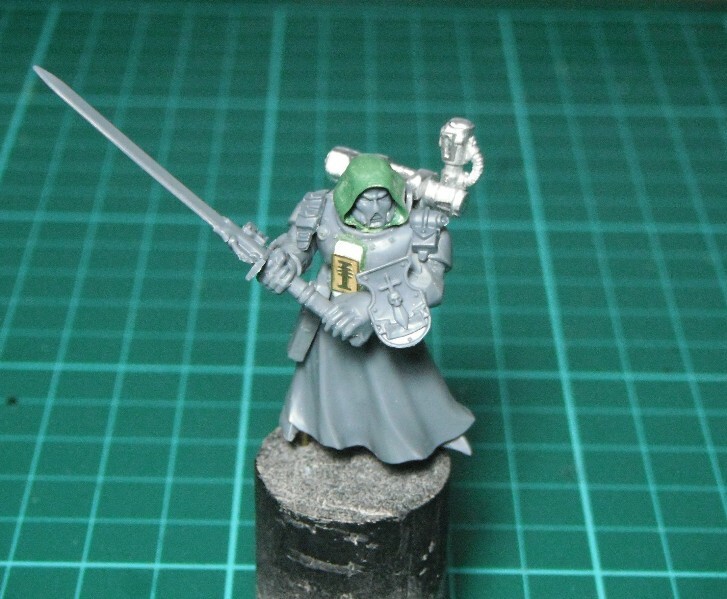 This model is a fairly basic kitbash based around a Warhammer Chaos Sorcerer with a Space Marine torso. The hood is sculpted on with greenstuff. The arms were a bit of a problem and show the difficulty I had in sourcing some of the parts. Originally I was planning on using Space Marine scout arms as they have sleeves rather than armour and the gloves are a close match for Covenant’s gloves on the original model. However, I couldn’t get them to look right holding a sword and so I tried him holding a shotgun but that didn’t look right either. In the end I settled on a pair of Grey Knight arms with the stormbolter clipped away and replaced with a small shield. In game terms this will be some kind of force field generator. Initially, I was worried that this would make him look too much like a Space Marine but I think the paint job prevents that. Below is a work-in-progress photo which should help you see which parts I’ve used. 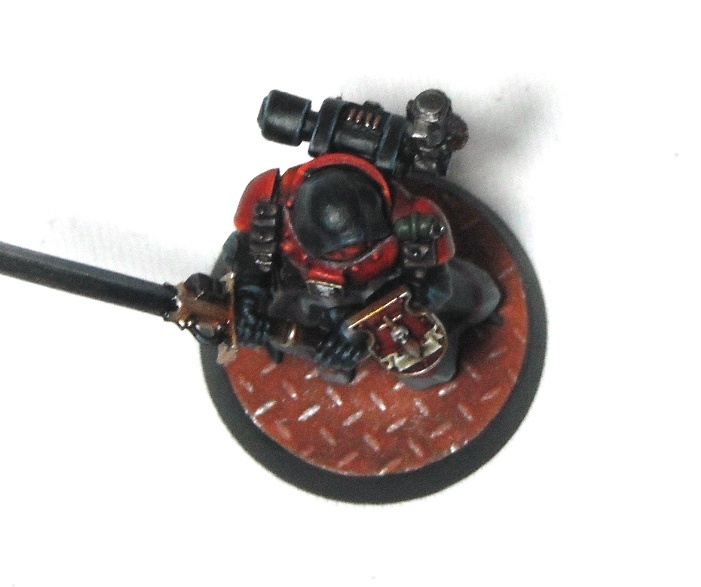 The backpack is an old metal piece taken from a Space Wolf Scout. It works well and the scanner helps to balance the huge sword on the other side. I did toy with the idea of a shoulder-mounted MIU weapon like on Inquisitor Covenant but couldn’t make this look convincing. However, I think the backpack helps to maintain the silhouette of the original model. Once the basic shape of the model was established the rest was just adding details like a book, a holstered pistol and some pouches before painting. 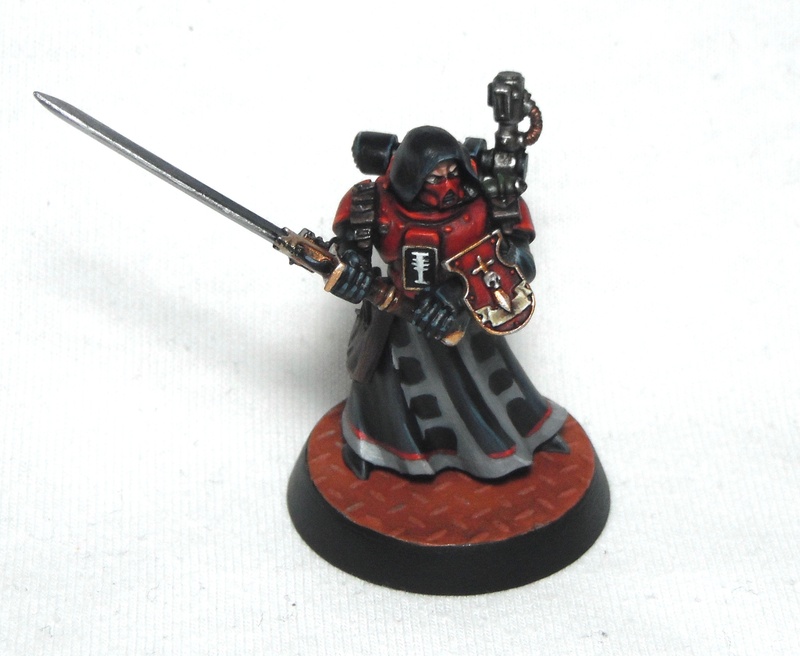 For the colour scheme I again followed the original model with black robes (highlighted up through Dark Reaper and Thunderhawk Blue) and red armour (shaded with purple and blue washes and glazed with reds). 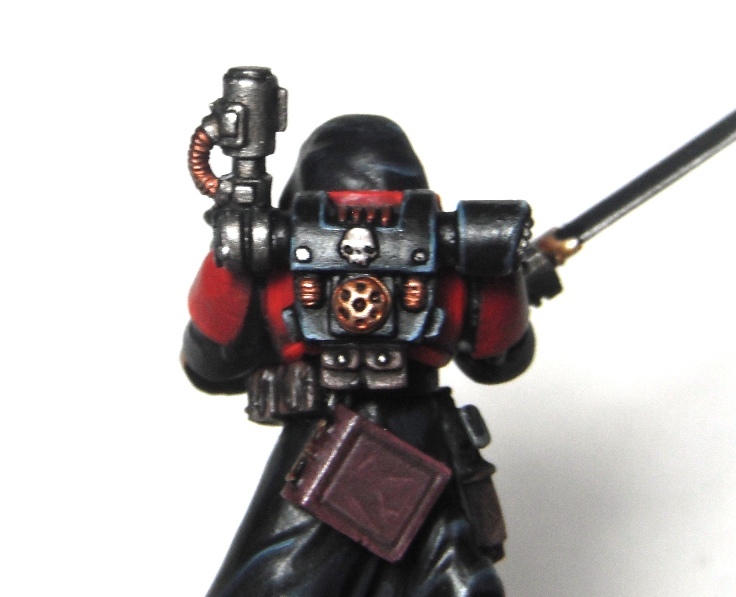 I then added a freehand Inquisition symbol like the one found on Covenant’s trenchcoat. I think this really is the focal point for this model and stops the lower half looking too plain and boring. One thing that I tried on this model was using gloss varnish over metalics. I think this works really well as it helps to harmonise the different colours used stops the matte effect that you can get from using washes and glazes over metallics. It also gives the metal a very shiny look. The sword blade is perhaps the best example of this. 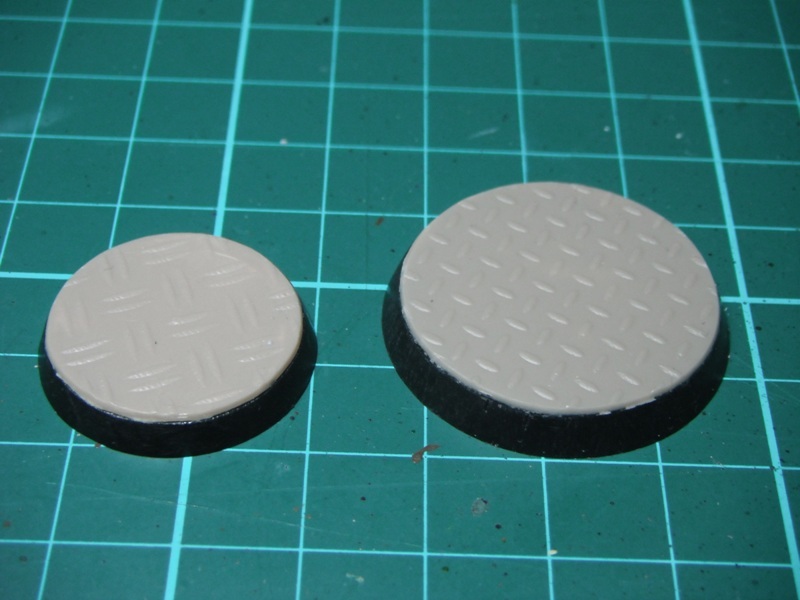 Finally, I wanted to recreate the rusty orange bases seen on some of the original Inquisitor models. To do this I spread thin plastic glue over the base right up to the edges. I then stuck on a piece of textured plasticard and left this to dry with a book on top to ensure it dried flush to the base. When this was done I trimmed the plasticard to fit the base and filed the edges and filled any gaps with Milliput. The base was painted Skrag Brown, washed with Reikland Fleshshade before being drybrushed Skrag Brown, Jokaero Orange and finally Chainmail. This gives a nice warm orange/brown look which is very different to any other bases I’ve done before. 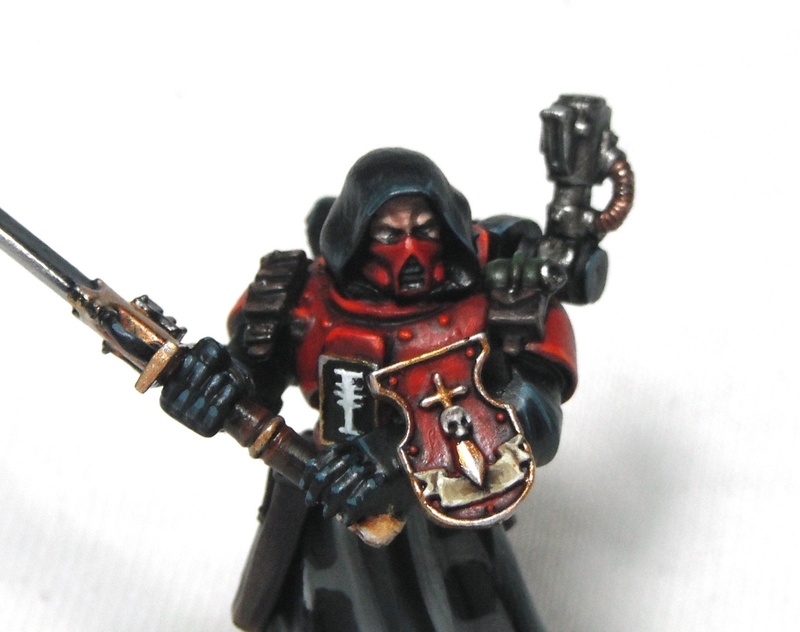 I also think it complements the red on the model nicely. On a personal note, it was nice to spend time painting a single character model after weeks of painting large numbers of infantry at Warhammer World. 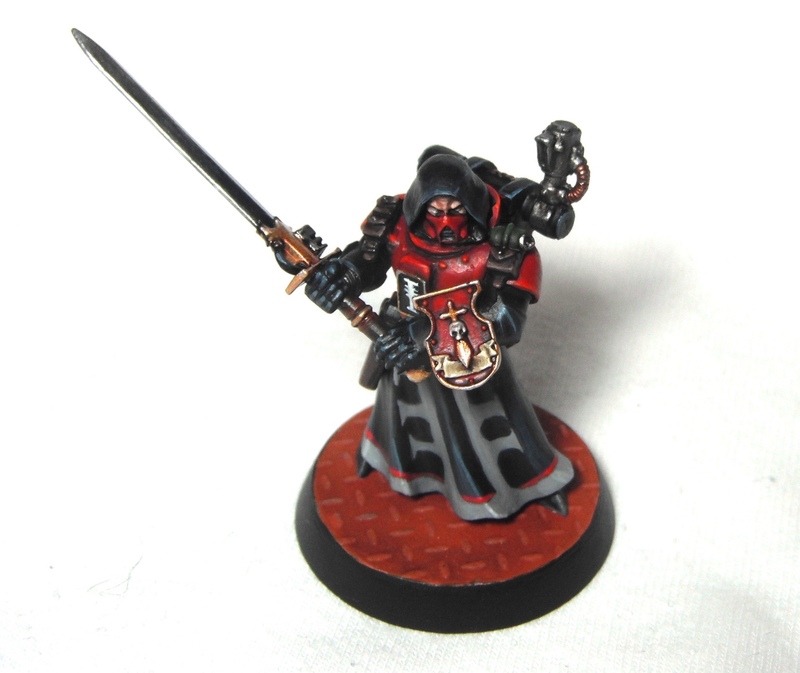 During my time in Nottingham, I also converted a number of Imperial agents some of which will form his retinue and others who will be part of other warbands. I will cover these conversions in my next blog post. As always, if you have any questions about how I went about painting the model or any other general comments I’d love to hear from you. Drop my a line below and I will try and get back to you. *Edit – I have just been informed that Inq28 and Inquisimunda are two different games systems used for playing out battles between warbands. I will have to investigate further. The motif on the robe turns it from something great into something sublime. Really great. The robe really makes this piece. I agree with sho3box. It just gives him this wonderful feel of utter brutality and high station. Oh man, that is really really nice! 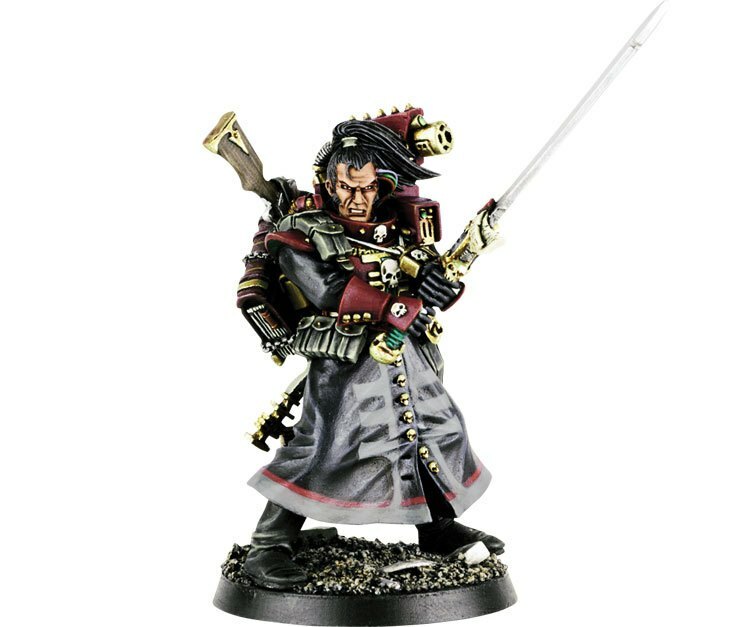 Love the conversion – great pose, and a cracking paint job to boot. Love it! Bang tidy work here mate. I’m a big fan of INQ28, and this is exemplary. Where did you find that plasticard? Thanks for the comments. It’s great to hear so people being so positive about a model which really was a step out of my comfort zone. I like his stance. Great job with the model mate especially the painting. I really like the highlighting you’ve done. 10 points to you!! Superb work! I’m a massive Inquisitor fan and this piece is a great tribute to that epic game, well done sir! Where did you get the checker plate from? On the base? See my earlier comment.